Thank you to everyone who watched LIVE on Saturday night. You can watch the replay here and I am sharing the links I promised. I did it again. I clicked on the wrong button when I changed screens, so you saw this when you should have seen me sewing. The good news is . . ..
. . . . that you can skip ahead and not miss anything. 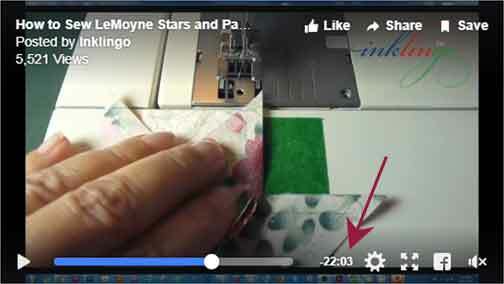 When you play the video (the first image above), you can click on the play line (blue line above) to drag it forward to about -22 minutes (red arrow) to skip ahead. I repeated myself, so you won’t miss anything if you skip ahead. I’m sorry for making this mistake and sorry it took me a few minutes to see it. Thank you to everyone who tried to alert me on Facebook. I appreciate your patience while I am learning this complicated software and equipment. Monkey says, we’re making progress because I did get it right several other times. Printing on fabric is more my speed. I was not cut out to be a technical whiz—but I try. Did you notice my desk chair? For the videos, I sit in a dining room chair, so I can use my usual chair as a bulletin board. Just like Inklingo, the simplest option is often the best. AS PROMISED—LINKS MENTIONED IN THE LIVE VIDEO . 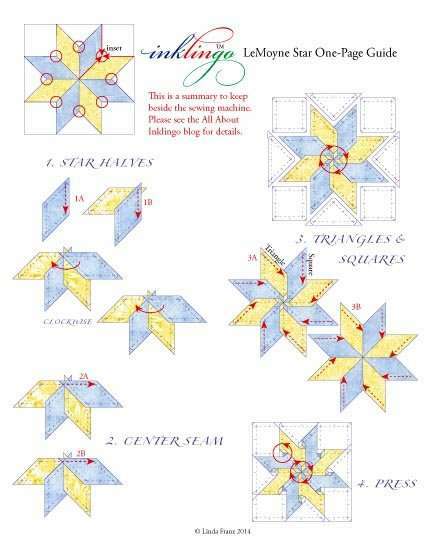 The demo in the video is summarized in an article from 2014, where everything is illustrated and you can download the one-page guide for 8-pointed stars. 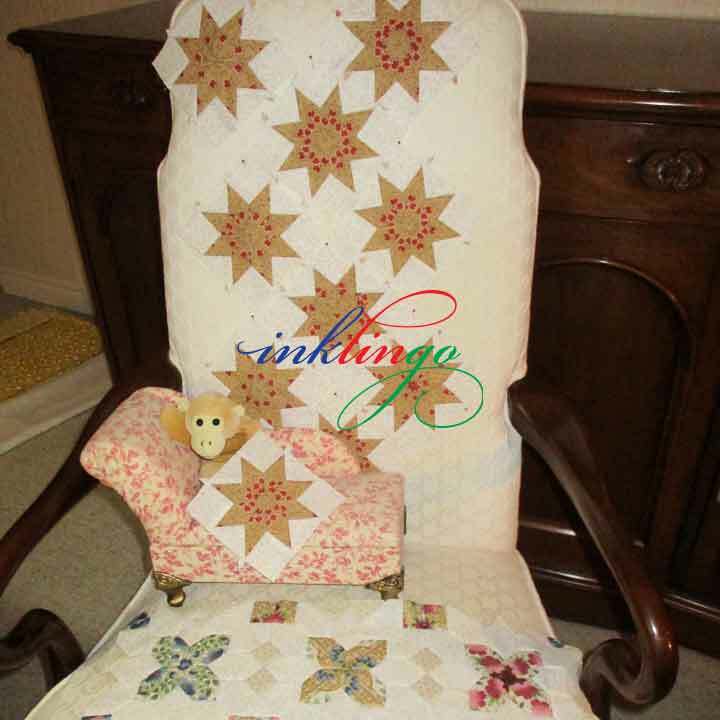 I had a great quilt layout for stars to show you but I ran out of time. 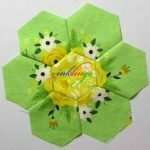 The free pattern uses the FREE Diamond Triangle Square shape collection and has been on the blog since 2011. I also wanted to finish talking about the advantages of the pressing technique in the video. For now, I’ll just mention that when you press the seam allowances clockwise around the center in all of the stars, the seam allowances will nest perfectly when you join the star blocks together. 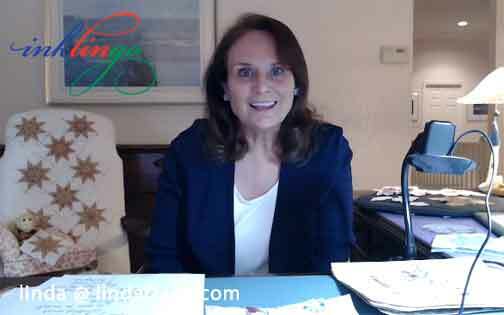 We press the same way when we hand piece, so I will talk more about the advantages of this pressing technique in another LIVE video. 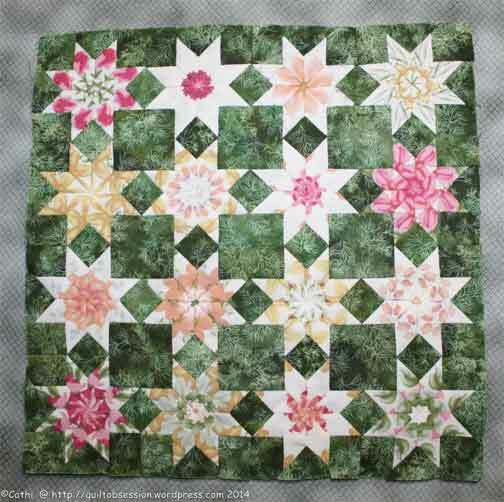 I shared this LeMoyne Star quilt (3 inch blocks!) 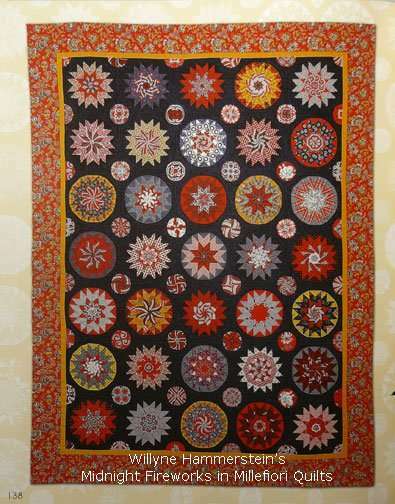 from Cathi’s Quilt Obsession Blog. 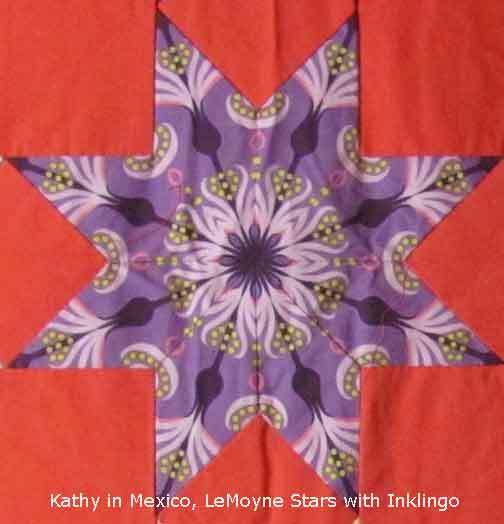 If you visit there and search for LeMoyne, you will find many more star designs. I recommend subscribing to Cathi’s blog too. I also had this photo teed up to show you. 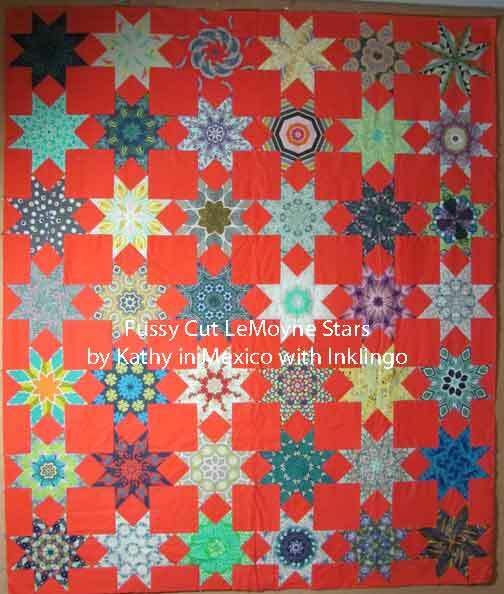 Kathy’s fussy cutting is fabulous and . . .
. . . you can see the fussy cutting in dozens of stars, close up on Flicker. Aren’t you glad you visited today! There are many other Inklingo projects in Kathy’s amazing Flickr albums. 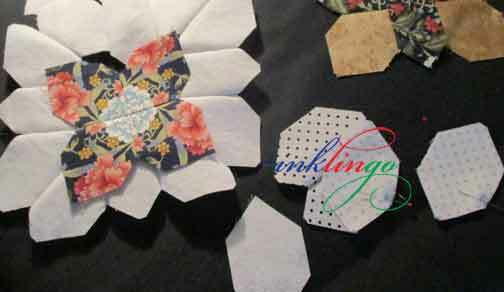 Midnight Fireworks from Millefiori Quilts (first book) is another Inklingo shape collection that uses 8-pointed stars. You can use the technique in the video for those stars too. 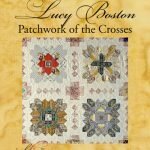 I sewed several hexagons by machine in the video but I ran out of time to show you how I use them for Patchwork of the Crosses. My hybrid POTC has some seams by machine and some seams by hand. 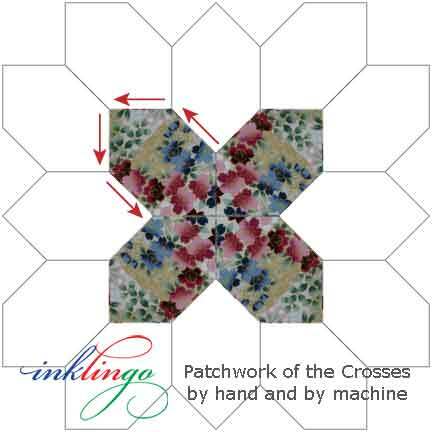 You saw me join the white hexagons by machine, sewing crosshair to crosshair. That leaves me with some relaxing, portable “continuous stitching” for 16 short seams. Hybrid piecing gives me the best of both worlds. I also mentioned a few more links. 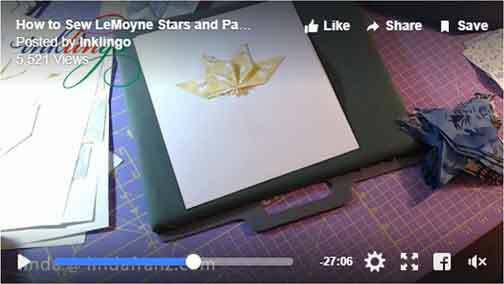 Main Beginner’s Page (link from top right of every page on the website or in the Shop) Get the free shapes and start sewing stars! 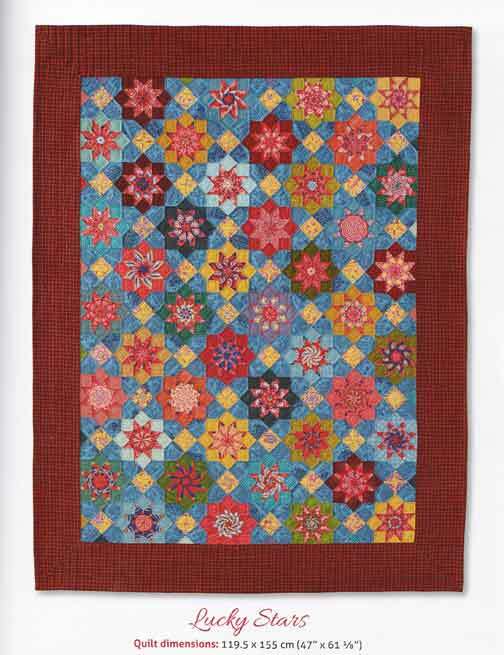 Quilted Diamonds 2 book with DVD is perfect for learning all the fine points of hand piecing. By now, you know that I am technically challenged. Printing on fabric is one of the easiest things you can do with a computer. Managing live video must be one of the hardest but I’m not giving up yet. Here’s another video that is NOT live, so there are no built-in mistakes. 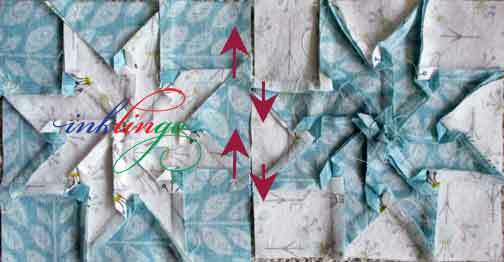 8 minutes to get you started printing free shapes on fabric. It is up to YOU to make sure Facebook shows you what you want to see. On January 11th, Facebook made some big changes. 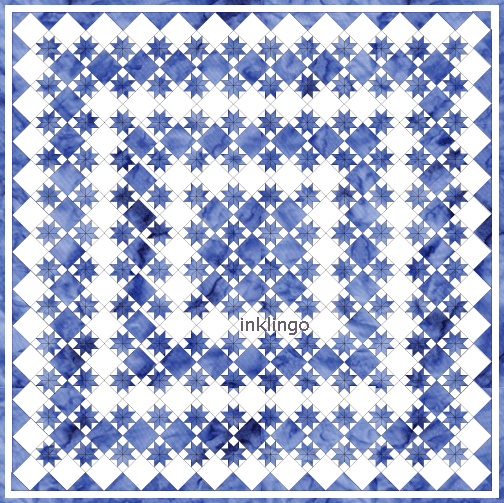 They only show the videos and images I show on the Inklingo Facebook page to fewer than 1% of the 44,780 quilters who have liked the page UNLESS I PAY THEM. “Pay to play” is how Facebook makes billions. This means that your Facebook feed is going to give priority to businesses that pay for ads. I am keeping the videos free, so I cannot afford to pay hundreds of dollars to notify you when the next one is coming. Visit the Inklingo Facebook Page regularly. The more you like and comment and SHARE, the more likely Facebook is to decide to show you my photos and videos next time. Choose “follow” on the Inklingo Facebook Page. No guarantee—but you are more likely to see my photos. Subscribe to the blog, so you get an email when I post here. The link is at the top of the right side-bar (or below the content on mobile). Exciting news in the video—a new shape collection for LeMoyne Star 8 inch is coming in the next few days. 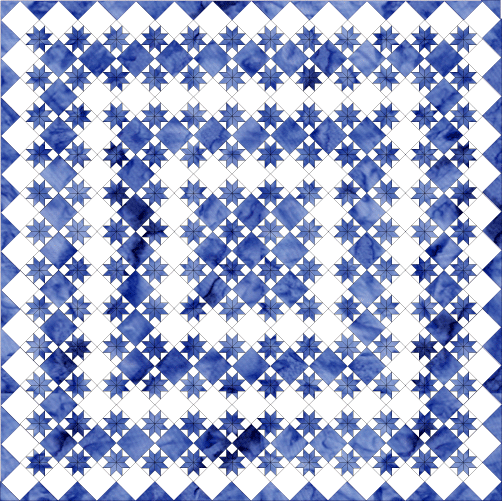 It also includes bonus shapes, so you can make Lucky Stars, one of the beautiful designs in Millefiori Quilts 3. I hope you will tell your friends about the LIVE videos and come back again next time. It is odd to talk to a camera without being able to see you, so your comments on Facebook and here are a lifeline. Thank you!